“The only thing necessary for the triumph of evil is for good men to do nothing.”― Edmund Burke (in a letter addressed to Thomas Mercer). Whilst men are linked together, they easily and speedily communicate the alarm of any evil design. They are enabled to fathom it with common counsel, and to oppose it with united strength. Whereas, when they lie dispersed, without concert, order, or discipline, communication is uncertain, counsel difficult, and resistance impracticable. Where men are not acquainted with each other’s principles, nor experienced in each other’s talents, nor at all practised in their mutual habitudes and dispositions by joint efforts in business; no personal confidence, no friendship, no common interest, subsisting among them; it is evidently impossible that they can act a public part with uniformity, perseverance, or efficacy. In a connection, the most inconsiderable man, by adding to the weight of the whole, has his value, and his use; out of it, the greatest talents are wholly unserviceable to the public. No man, who is not inflamed by vain-glory into enthusiasm, can flatter himself that his single, unsupported, desultory, unsystematic endeavours, are of power to defeat the subtle designs and united cabals of ambitious citizens. When bad men combine, the good must associate; else they will fall, one by one, an unpitied sacrifice in a contemptible struggle. It's as true today as it was 200 years ago--except for now, in modern times, the sin of giving into political apathy would be extended to women too. 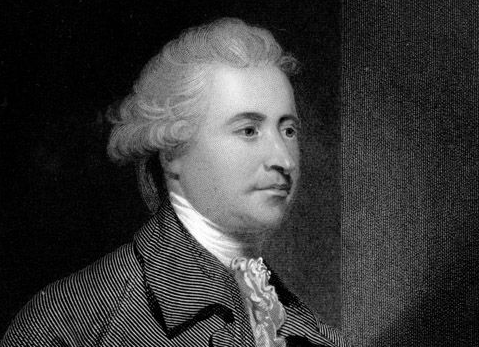 Edmund Burke's writings, which laid the intellectual foundations for modern conservatism (a cautious kind of conservatism, to be precise), can be found in our collections of Free eBooks and Free Audio Books. You can also download his major work, Reflections on the Revolution in France, through Audible's Free Trial program. I feel like the information provided above is good but can be more reasearched. The following information can be included when the letter was discovered and by who. Interesting that the phrase can appear as, The only thing necessary for the TRiUMPh of evil….. Interesting, but sad, that this quote resurfaced in my memories as I was listening to The Donald vomit forth some of his usual hate-speech. I appreciate the letterbeing posted on your site. It’s not as though we see this level of script online often. While Donald Trump may have a ungentlemanly and sometimes cruel way of speaking the truth, at least he seems to be on the side of the good people taking action against the evil in America. He seems to be pro-life, and the pro-lifers opposing the new New York legislature are good men and women taking action against the triumph of evil. This is my favourite phrase. It still stands true today. Ive had a time of weakness and assumed as Ive spent my life helping friends and strangers alike that I would be supported. One has helped, the government help is so minimal and difficult to engage. When did the weak become viewed as evil parasites??? Very True words Mel. He speaks like a street brawler, but is on the side of good.